Django Unchained – Official Trailer (HD), JoBlo Movie Trailers, http://www.youtube.com and photographs © Sony Pictures Releasing. And now to Django Unchained (2012) a Quentin Tarantino homage to spaghetti westerns, with one helluva fantastic soundtrack and an absolute cad of a villain played to moustache twirling heights. I was astonished at the bravery of this casting for the two supporting roles in this film, as this character was played by a Realweegiemidget favourite. He’s a lead not normally associated with scoundrel type roles, Leonardo DiCaprio. And in a similar twist of roles, I was surprised to see an actor I associate with bad guys, as a more lovable character. Notable evil examples being his equally charismatic roles as Blofeld in the last James Bond offering, Spectre (2013) and Col. Hans Landa in Inglorious Basterds (2012). This actor being Christoph Waltz, he of the Austrian accent whose charming, dulcet tones could sell chocolate to a confirmed dieter. But for me – and not just as I have a major soft spot for DiCaprio – DiCaprio’s Southern accented, moustache and goatee sporting, evil plantation owner stood out despite the fact Waltz literally waltzed away with the Best Supporting Actor Award at the Oscars. The opening blood-red credits, in a font reminiscent of many a Western movie, sets the scene for this movie. This film was written and directed by Quentin Tarantino. The film starts in Texas in 1858, shows some coloured slaves shackled together by the ankles as they are driven like cattle by the Speck brothers. One night they meet a charming, polite and charismatic German, introducing himself as a one time dentist, Dr King Schultz (Christoph Waltz). Schultz wants to buy a slave by the name of Django to assist him to find the Brittle brothers. Django (Jamie Foxx) identifies himself, and as Schultz negotiates to buy him, he seems quite a reasonable kinda guy. After agreeing on a transaction, things turn ugly and Schultz shoots one brother, and wounds the other. Letting the other slaves free, this humanitarian German exits with Django. The pair hit Tennessee, where Django’s coloured skin and apparently equal status to Schultz horrify the townspeople. As the pair enter a public house, the owner runs to get the sheriff to remove Django from the premises. Schultz talks with Django revealing his true vocation as a bounty hunter, and we learn his motives and plan as he outlines them to Django, who he sees as his equal. The pair make plans to find the brothers and shoot them for a large bounty. After which Schultz promises Django his freedom, as he hates slavery. After a confrontation with the sheriff, Schultz shoots the sheriff dead. The silver-tongued Schultz tells the horrified townspeople and the US Marshall (Tom Wopat) that their Sheriff was a wanted outlaw. The pair then leave to confront the Brittle brothers at Big Daddy’s ranch. And the actor behind the goatee is none other than Don Johnson. The Brittle brothers have figured in Django’s past with a flashback of the chasing Django and his wife and then beating his wife, Broomhilda Von Shaft (this name, one of Tarantino’s more obvious blaxploitation tributes). And after a bloody dispatch of these bad guys, Schultz gives Django his freedom. He learns – in a great wee montage – that Django has a deadly accurate aim in gunfire proving he can fatally wound someone. And so the pair form a partnership (of sorts). Schultz vows to help Django find his wife as a matter of honour and tells the German legend of Brunhilda. Brunhilda, was a woman saved from a nasty dragon by her lover, Siegfried. And leads a fun random but bloody thirsty Tarantino inspired scene from an early version of Ku Klux Klan with jonah Hill joining in in a small part. So after this more bizarre turn of events, the pair head to Mississippi. here we first hear of Calvin J Candie (Leonardo DiCaprio) as the plantation owner of Candyland. He’s the man who bought Broomhilda (Kerry Washington), and she is now his property. After finding Candie enjoys Mandingo fights – a blood sport where coloured slaves fight each other to the death – the cunning Shultz makes his plans. He will masquerade as a man interested in buying such a fighter, with Django as an expert in this sport. The pair then meet Candie at a Gentleman’s club. There he is witnessing such a fight with absolute sadistic enthusiasm in contrast to the thinly veiled horror from the men. Candie even incites extreme violence between the Mandingo pair to end the battle. With an apt wee Western themed cameo (explained by Darlin’ Husband) in a lovely wee scene with Foxx’s character. Schultz and Django are invited to Candie’s ranch to finalise the sale, after Waltz offers to buy such a fighter for a crazy amount of money. On their arrival at the ranch, Candie confronts a Mandingo fighter up a tree surrounded by dogs. He is a runaway and at first Candie appears to be on this man’s side, as he starts to speak to him almost gently with reassurance. This however almost leads to him becoming patronisingly offensive as his characters’ true nastiness is slowly revealed. On approaching the ranch, it is revealed Broomhilda is in the hot box – a horrific form of torture where she is locked naked in a box – as she too tried to run away. Candie demands her presence at their dinner, as she speaks German and he wants to impress Schultz. As she is forcibly removed from the box, Django sees his wife. I gulp back the tears. The couple is later reunited by Schultz who invites her to his room on the pretext that he wants to speak in his native tongue. Schultz tells her of their true motives, and the married pair are reunited. However some meaningful looks between the couple are observed at the dinner table. And she is confronted by Stephen (Samuel L Jackson), a house slave devoted to Candie, about her and Django’s true relationship. Stephen tells Candie of his hunch about the pair’s motives and its hauntingly true. Candie goes ballistic for being conned by the pair .. and then goads the pair, in his sick physical acts and playing mental games beneath his snake-like charm..
Waltz makes his character likeable, charming, genuine and charismatic through his kindly actions towards Django and the other coloured characters in his movie. Foxx in a romantic lead role-playing Django has you feeling for his character’s intensity of his love for his wife. This shown from the start with memories and visions of her until the pair are reunited at Candyland. You feel for his predicament especially as he sees his wife and other coloured slaves being abused verbally and physically by Candie. His hatred for Candie and all that he stands for is apparent from the start. And we emphatise with him in this, as in DiCaprio characterisation of Candie, he is increasingly frightening and evil. Candie’s initial pleasantries to the main characters is merely a facade. He has a dark and evil side behind this Southern charm and hospitality. It’s shocking to see the lovely romantic lead DiCaprio of films such as Titanic (1997) and The Great Gatsby (2013) in such a role. He is almost camps this Django Unchained character up to cartoon proportions – the evil Hooded Claw (the villain of The Perils of Penelope Pitstop (1969-71)) springs to mind – but with a R rating. He smoothes his goatee and moustache, and hams up his Southern drawl. And there is nothing redeemable about him, unlike his character in Shutter Island (2010) where (wee spoiler) an apparently nice man had a more disturbing side to his character. His evil side is made more horrific and unsettling as the film continues as he taunts the pair on learning of their true intentions in a macabre scene. In this act, filled with sadistic, taunting malice he sets to put the pair in their place. Later Candie’s sparring verbal scenes with Schultz, then frighteningly foreboding. 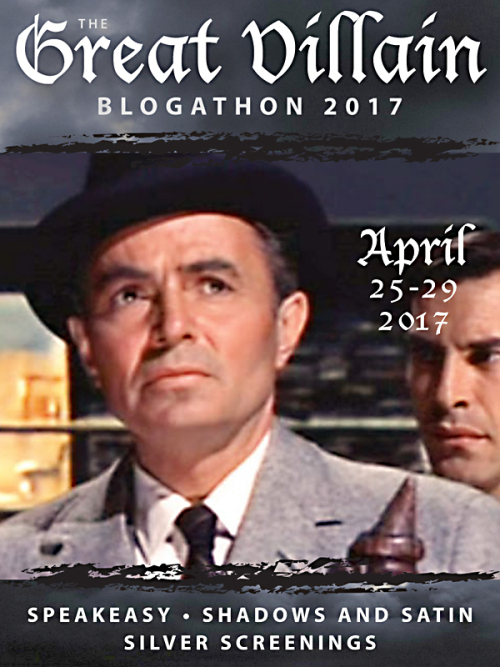 This review was entered in the Great Villain Blogathon, This blogathon is being held by Ruth of Silver Screenings, Karen of Shadows & Satin and Kristina of Speakeasy. Films with this cast include The Great Gatsby and Shutter Island with Leonardo DiCaprio. Waltz stars in my Spectre review. Tom Wopat is reviewed in Dukes of Hazzard in 5 Film 80s Film and Telly Cars, Don Johnson in 80s Hollywood Hitmakers and Jonah Hill in War Dogs (2016). And another cameo stars in John Wick 2 and The Time of Their Lives both released in 2017. This is such an excellent movie, and a great post in addition! Calvin Candie is such a despicable and immoral character in every way, and Leo was ROBBED of an Oscar nomination!! I think this was one of his best roles because it truly shows how versatile he is as an actor. I think The Aviator was just exceptional, and was also Oscar worthy! He really captured the essence of someone suffering from OCD. I have Shutter Island bought but I still have to see it (I know I know :P). Based on your moving description of this film, I think it would make me cry, too. I shied away from this film because I’d heard it was so violent, but I didn’t realize there was a tender love story in it, too. I can only imagine how terrific Leonardo DiCaprio is in this role. As you described him, I could just imagine what a detestable character he plays, and how believable that would be.